Milliblog Weeklies – APR14.2019 by Milliblog! 17 songs, this week. All 17 on YouTube playlist, and 14 in the JioSaavn playlist. The 3 missing songs: Ayyane by Navneeth Sundar, Zindagi mein toh sabhi by The Green Room Tapes Collective featuring Srinivas and Sanah Moidutty’s Karutha Penne. Aira Gaira – Kalank (Pritam) – Hindi: I was underwhelmed by ‘Tabaah Ho Gaye’ despite the firepower on display – Shreya’s singing and Madhuri’s dance. The song seemed like Pritam was laboring on the classical‘ish format and it didn’t quite hit the mark. But when it comes to a crowd-pleasing qawali item number, he hits the mark confidently! 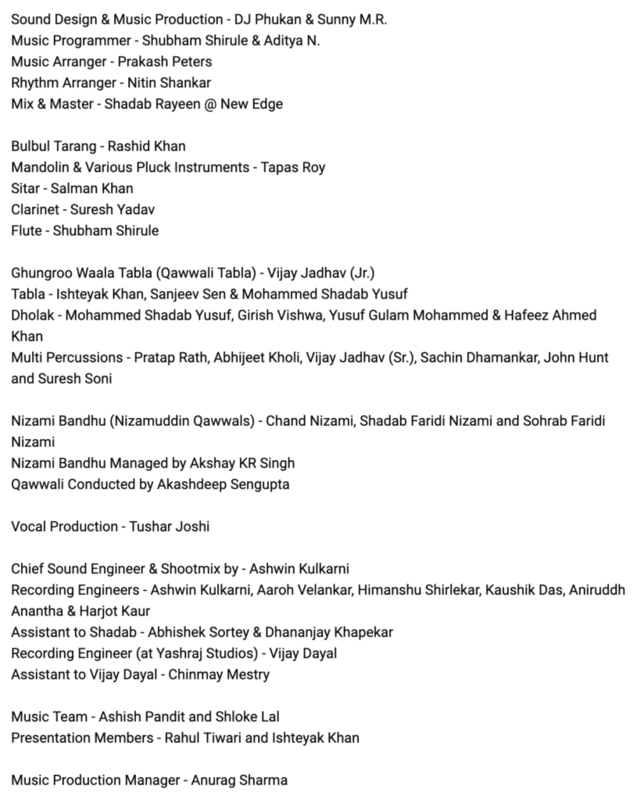 The sheer detailing of credits showcases the amount of effort that has gone into the song… and it shows in the output. Antara Mitra carries the song, ably supported by Javed Ali and Tushar Joshi. The melody is catchy, the hook addictive. Even if you watch the YouTube video, please listen to the full song on JioSaavn to savor the song for the sake of music. Sambhaal Rakhiyaan – Music Teacher (Rochak Kohli) – Hindi: When Neeti Mohan takes off with the ‘Rabba mere jeene ki waja hai’ phrase, the song takes off too, moving on from its otherwise staid beginning that I have come to associate with the Rochak-sound. But Rochak plods on with such little surprises in the predominantly-Punjabi melody, aided superbly by Neeti Mohan’s delightful singing. Aagaasa Veedu Kattum – Dear Comrade (Justin Prabhakaran) – Tamil: Justin Prabhakaran, who has been oddly missing in action since early 2018’s Oru Nalla Naal Paathu Solren, makes a well-deserved return! The song reminded me of a few Sahana-raaga compositions (like Paarthen Sirithen), so I’m inclined to guess that it could be based on the raaga too. But that main guitar piece that repeats a lot seems to sound like Bilahari-raaga (Raravenu Gobala). It also shines the light on singer Gowtham Bharadwaj who is really good with the vocals. Justin’s quirky background sounds too add tremendous value, like that background jathi and a sound that I can at best explain as a man shrugging vocally!! Thandalkaaran – NGK (Yuvan Shankar Raja) – Tamil: Even though Selvaraghavan has already joined Yuvan for films like Nenjam Marappathillai (music released, film delayed) and Mannavan Vanthanadi, after their stellar combo in earlier films that ended with Pudhupettai and Aadavari Matalaku Arthale Verule, here’s another film from the duo! It is definitely promising, with a deep and resonant sound that portends something much grander in the scenes! Yuvan crafts the sound beautifully, and it builds up impressively amidst Ranjith’s singing. Prapanchame Alaa – Jersey (Anirudh) – Telugu: The melody’s unusual layering on the rhythm in the pallavi (or the meter of the lines in the pallavi itself) was immediately noticeable. And then Anirudh unleashes Keba’s classical’ish guitar in the interlude! Then, the almost-Raja’ish anupallavi! Then the singing by Shashaa Tirupati and Inno Genga… there’s so much to enjoy in this lovely song! 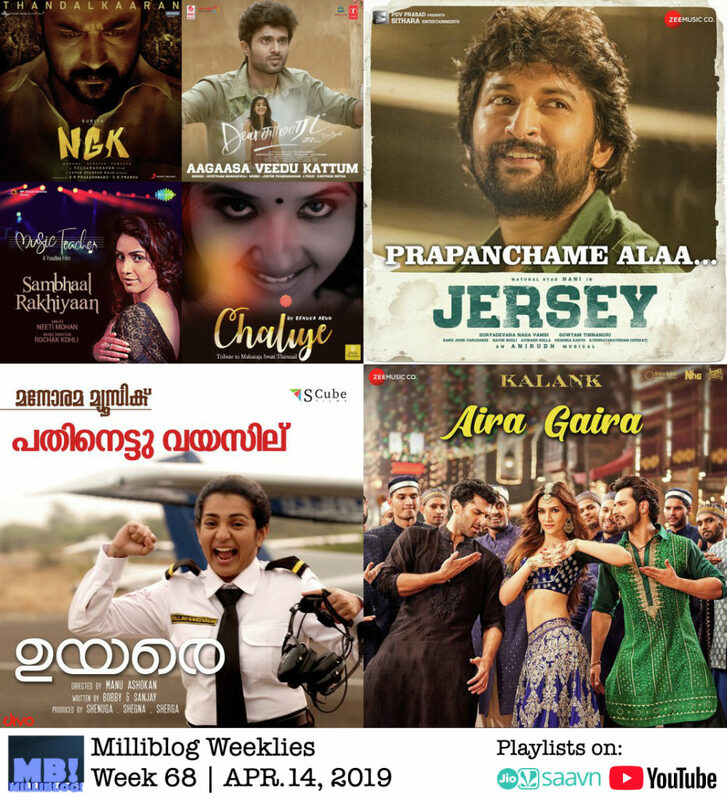 Pathinettu Vayassila – Uyare (Gopi Sundar) – Malayalam: Gopi follows up last week’s single with another winner from the film. This time, besides his beautifully serene music, the other star is singer Krista Kala, of Media One’s Pathinalam Ravu fame. She, quite literally, breathes life into the whispery tune! Her singing soars beautifully towards the end as the tune too soars, leading to the film’s title! Athippoovin – Oronnonnara Pranayakadha (Leela Girish Kuttan) – Malayalam: Wow, what a song! Some of the musical phrases seemed a bit like early-Rahman, and the raaga sounded to me like Reetigowlai. A bit of Vidyasagar’ish flourish in the overall music too, if I may add. Excellent work by composer Leela Girish Kuttan, who I believe is visually-challenged! Pavizha Mazhaye – Athiran (PS Jayhari) – Malayalam: Composer Jayhari does have something going on in the Athiran soundtrack. This is the 2nd song that is very listenable. Harishankar K.S’s splendid singing aside, Jayhari’s music is imaginatively expansive. Marethuhoyithe – Amar (Arjun Janya) – Kannada: This is by-the-numbers music by Arjun, but even within that template, he has great support from Sanjith Hegde, who elevates the tune significantly with his singing. Nee Gnyapaka – 99 (Arjun Janya) – Kannada: As if topping all the song he has done so far for the Kannada remake of the Tamil 96, Arjun aims very high in Nee Gnyapaka and succeeds very well too! Besides the expectedly great singing by Sonu Nigam and Palak Muchhal (and not Shreya? Very surprising! ), the musical flourish by Budapest Art Orchestra (Hungary) lifts the song significantly. Boogie Down – Chezin: Chezin is Chetan Dominic Awasthi, a Delhi-based musician. Boogie Down is a wonderfully done Michael Jackson tribute. Chezin even sounds like Suresh Peters, who aced this game way back in the early 2000s. In Chezin’s song, even the music (and not just the vocals) seems like MJ’s music, though it doesn’t buildon MJ’s style as much as how Bruno Mars does, and is content in mirroring it almost exactly. Chaliye – Renuka Arun: Singer Renuka Arun, who was exceptionally good in Gopi Sundar’s new-age version of Endaro, from Bhale Bhale Magadivoy, and Solo’s Seethakalyanam, is back with her new single. This one is a Swathi Thirunal composition set to Brindavana Saranga raaga. With only Sumesh Parameswar’s support in the form of guitars, it’s virtually Renuka’s stellar show! And she is simply superb with her vocals! Ayyane – Navneeth Sundar (Malayalam): An ethereal melody about Lord Ayyappa. Sung with the necessary gravitas by veteran P.Jayachandran and set to fantastic music by Navneeth Sundar. I believe the song is set to Raghavarthini raaga, and that is one major reason for the melody’s powerful impact. Zindagi mein toh sabhi – The Green Room Tapes Collective, Ft. Srinivas: A fantastic reimagination of Mehdi Hassan’s iconic original ghazal, in Srinivas’ fantastic vocals. Where the recreation stands out is the influences it wears on its sleeve proudly during the interludes! They feature specific and creative homages too – that of MS Babu Raj’s Thamasamenthe Varuvan, from Bhargavi Nilayam and Srinivas’ own Ini Naanum Naan Illai, from Yai Nee Romba Azhaga Irukke. Karutha Penne – Sanah Moidutty (Malayalam): Going by the comments in the original Malayalam song’s video, it clearly looks like Sanah’s new remix is a massive hit. It has raked up 11 million views and going strong, and I hear this is a huge hit in Tamil Nadu with it going wild on Whatsapp! Sanah has been doing impressively mounted remixes already (I loved her Shyama Meghame remix, from Adhipan). Karutha Penne joins this list effortlessly, and she aims higher too, making it a statement about skin color! Summer Lover – Oliver Heldens ft. Nile Rodgers, Devin: Lovely disco-tinged electronic track from the Dutch DJ Oliver Heldens. The song starts on a somber note but builds towards the ebullient and danc’y hook brilliantly. SOS – Avicii featuring Aloe Blacc: The new single from the late DJ’s posthumous album, Tim. The EDM grooves are intact and thoroughly enjoyable, but so is the unusual keyboard play that elevates the song.